Home > Found an Injured Marine Animal? > Found an Injured Dolphin or Whale? Q. 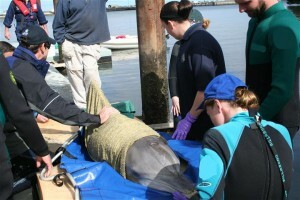 What should I do if I find a beached dolphin, entangled or injured? Keep all non-essential people away from this animal as dolphins and small whales are extremely susceptible to stress. Keep all dogs as far away as possible (out of sight and vocal range). NO DON’T cover or get water inside the blow hole – timing is important when wetting down dolphins and whales – poor small amounts of water over the animal head in between breaths. Dig a small hole under each of the flippers so that the flippers do not hit or are squashed against the sand. Dolphin and whale skin is pressure sensitive and is important to keep it in good condition; constant rubbing on sand can easily damage their skin and is very painful for the animal. DO NOT “pat” or “stroke” these animals – this will only add to already increased stress levels. Keep the animal well shaded and the noise level at an absolute minimum and remember to keep all non-essential people away.